Dark fantasy and paranormal fantasy fans will find J.H. Moncrieff’s first installment of her GhostWriters series a flawless read. Exceptional character development, a tightly plotted storyline, relentless pacing, and a perfect fusion of horror and irreverence make this virtually impossible to put down. Tired of his mundane existence in Minneapolis working in the IT department of an insurance company “watching paint dry in the cubicle forest,” Jackson Stone has embarked on the adventure of a lifetime: exploring abandoned cities in China as part of a tourist group. The wise-cracking Stone finds a way to spend the night in China’s most infamous haunted area: Hensu, a city completely destroyed after a dam opened and flooded the area, allegedly killing countless people. During the night, surrounded by nightmarish statues, Stone is visited by a ghostly young woman who desperately wants him to tell her story, which is also the story of Hensu’s destruction. The next day, the woman is gone and Stone is in serious trouble with the shady tour guide, who wants him arrested for illegally trespassing on a historic site. Aided by a woman on the tour—a beautiful medium named Kate —the unlikely duo set out share the woman’s story while trying to evade local militia. Regardless of how this novel (and series) is marketed—horror, dark fantasy, supernatural suspense, etc.— the narrative seed is a ghost story, like the timeless and treasured paranormal mysteries of the early 1900s by Algernon Blackwood and Cherie Priest’s Eden Moore and Kat Richardson’s Greywalker sagas of the early 2000’s. But Moncrieff has done something remarkable here: She has taken something old and made it new again. Stone and Kate—the skeptic and the medium—make a dynamic pair, and the sexual tension doesn’t hurt either. With the novel’s addition of exotic locales, adept storytelling, and a decidedly creepy undertone, Moncrieff could very well be the 21st century’s version of Algernon Blackwood. 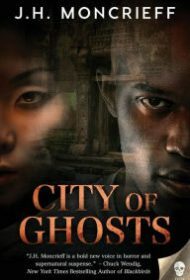 City of Ghosts is unconditionally recommended.